QUANTITY: 10 felt hearts made from 100% wool SIZE: 3 - 4 cm. COLOR: Choose from 35 color options. You will get 10 of the same color and style. These felt hearts/stars are imported from a manufacturer in Nepal. Azo free dyes are were used to make the balls. These felt unique felt stars/hearts are perfect for all types of decoration. They string easily with needle and thread to make a garland banner for a fireplace mantle or Christmas tree. Or scatter them on a table for an easy and unique decoration. 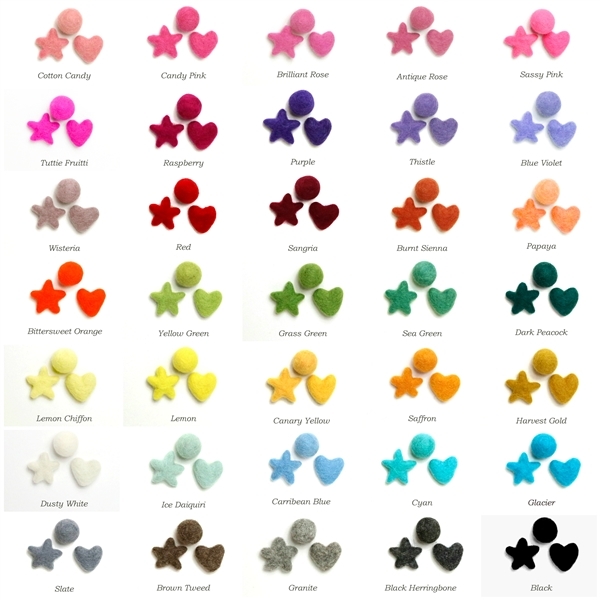 Felt star/heart colors are NOT made to match our 100% wool felt sheets, rolls, ribbons.